Allen B. Hayward: The Man Who Lived in a Tree | Park View, D.C.
Allen B. Hayward, photographed on May 8, 1920, at the age of 81 (Image from Library of Congress). Among the more curious tourist attractions, and Washingtonians, in 19th Century Washington was Airy Castle, the tree-top home of Allen B. Hayward. In actuality, during Hayward’s lifetime he had three tree-top homes. The first Airy Castle was located in today’s Columbia Heights. Hayward constructed it in 1883 and lived there for about a year until the property was sold, necessitating the need to build his second castle in 1885. 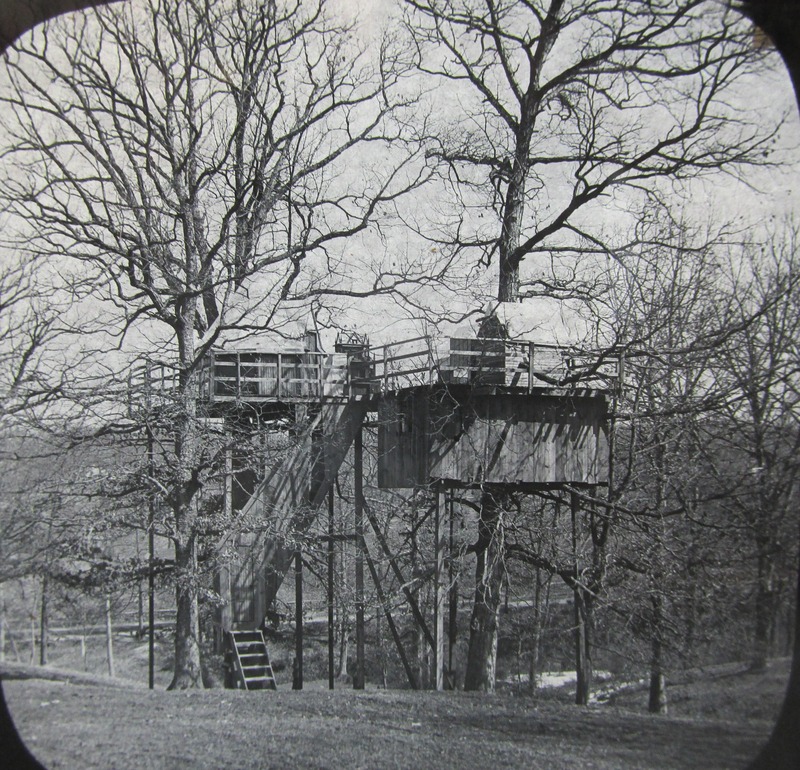 The first tree-top home was described as being one block west of 14th Street and northwest of the Columbian College property placing in roughly at the northwest corner of 15th and Euclid streets. The structure was between two great oaks about thirteen to fifteen feet from the ground and consisted of a platform among the branches upon which Hayward pitched a good-sized “bell” tent. Access was gained via a ladder which was pulled up each night. Hayward’s Airy Castle in 1885 (Image from collection of Kent C. Boese). The third and last Airy Castle was located in Forest Glen, about a half mile north of the streetcar station at the end of the line. He moved to this structure about 1903 by his own account. But it was Hayward’s castle built in Mount Pleasant that was the most famous, and the one which Washingtonian’s long remembered. Hayward’s second tree-top home was located on the Fourteenth Street Road as it was headed downhill to Piney Branch creek, placing it on the west side of today’s Sixteenth Street and just south of the Piney Branch bridge. This is roughly the location of the Woodner Apartments. The Mount Pleasant ‘castle’ was constructed on the side of the steep hill amide the arms of three or four great oaks, about 35 feet from the ground. After ascending a ladder, the visitor found themselves on a sturdy platform, below which was located “a big box that seemed to be hung under the platform.” This enclosed room – accessed by a short flight of stairs – served as Hayward’s dining room and kitchen. Drawing of Airy Castle showing later addition of dance floor. The ‘castle’ was described as octagonal in form and longer one way than the other – the overall dimensions being 13 by 9 feet. The walls were constructed of wood to a height of four or five feet, above which rose a double roof of canvas, securely fastened and firmly supported by poles. Hayward opened his tree-top home to visitors upon completion in 1885, and eventually entered into an agreement with his neighbor, Joseph R. Hertford, to combine their properties and create Airy Castle Park which included the castle and a pavilion for dancing, making the property an enjoyable city getaway. Hayward even marketed his house to visitors to the March 1889 inauguration of Benjamin Harrison by publishing a 32-page souvenir booklet on Airy Castle Park. Hayward was a Union Army veteran who served three years in the 2d New Hampshire regiment, rising from the grade of private to that of First Sergeant. His term of enlistment expired in the latter part of May, 1864. While awaiting his formal muster-out his regiment went into the Battle of Cold Harbor on June 3. Although Hayward’s official service was over, he took up arms and joined his company in the battle. This decision cost him his right arm. A rebel bullet found him, shattered his right arm, and the surgeons sawed it off nearly at the shoulder. After the war, Hayward settled in Washington and became a clerk in the Pension Bureau. By all accounts, Hayward lived well into his 80s, passing away sometime between 1920 and 1922. “A. B. Hayward Lived in House Atop Tree.” The Washington Post, December 6, 1927. P. 30. “The ‘Birdman’.” The Evening Star, November 19, 1944. P. C-4. 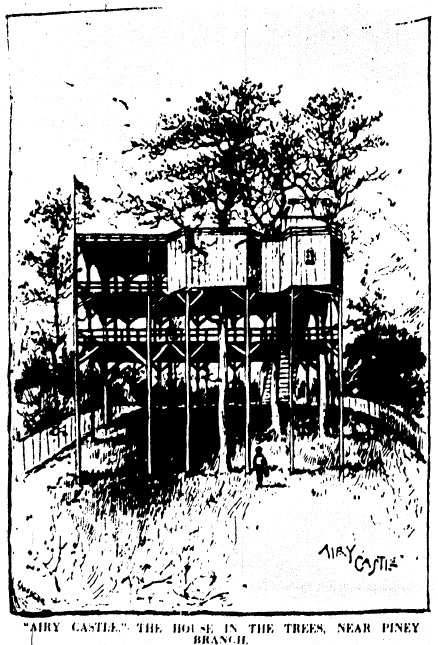 “A House in the Tree-tops.” The Washington Post, May 28, 1884. P. 1. “Life in the Treetops.” The National Tribune, May 28, 1885. P. 2. Proctor, John Clagett. “Mount Pleasant Inspires Recollections of Pastoral Condition.” The Evening Star, June 10, 1927. Part 7, p. 2. Proctor, John Clagett. “The Story of ‘Airy Castle’.” The Evening Star, July 10, 1949. P. C-2. Proctor, John Clagett. “Unusual Citizens.” The Evening Star, November 14, 1937. P. F-2. Proctor, John Clagett. “The Village of Mount Pleasant.” The Evening Star, October 26, 1947. P. C-2. Spears, Edith B. “The Flowery 80’s Were Gay in Old Mount Pleasant.” The Washington Post, March 31, 1935. P. F3. Swerdloff, David. “Airy Castle Park,” in Crestwood: 300 Acres, 300 Years. (c2013). Pp. 57-8. “The Tree Man.” Democratic Northwest (Napoleon, Ohio), June 20, 1889. P. 9. “Washington Man Lives in a Tree to Escape World’s Contamination.” The Washington Times Magazine, February 17, 1907. P. 2. This entry was posted on August 28, 2014 at 7:01 am and is filed under History, People. You can subscribe via RSS 2.0 feed to this post's comments.